We just relaunched brand-karma.com and that’s where my new blog posts will be. We decided to make the company site more information-rich, and so we’ve moved my content over there and integrated it into the site. Here’s a screen capture of the current home page, but this link will always be live to carry you to the site itself! I’ll see you over there! Postcard from China: I did it! I’ve still yet to leave Beijing but the last few days have been quite interesting. I had to give my first all-Mandarin presentation this week, first in Shanghai, then in Beijing. Though I’m somewhat fluent in Mandarin — I left Taiwan when I was 10 years old and grew up in the US, returning back to Asia only after my son was born 3 years ago — I was always more comfortable in a conversational setting. I only had formal language education through 4th grade in primary school, so talking to me is probably sometimes like talking to a school kid! I was asked by Travel Link Daily to talk about the trends in social media that I see and to share best practices on how to get greater ROI from social media investments to Communications Managers in the travel industry — including some our own clients. Originally, the presentations were supposed to be in English, but when the organizer saw that I was Chinese he asked my staff if I could speak in Mandarin, and my staff member said yes. And so the invitations went out “THIS SESSION WILL BE CONDUCTED IN MANDARIN!” Several nervous rounds of laughters later… I came to face the reality of the situation the night before I left for China. Thankfully, our newly formed Brand Karma Guide team, under the capable leadership of Kay, translated the transcript of my talk from English to Chinese, and also my slides from English to Traditional Chinese. Then our team in Beijing took over the slides and translated them from Traditional to Simplified Chinese. With over 1.5B Chinese people in the world, colloquialism can present huge challenges in our being able to understand each other even with the same fundamental language. On the plane, in the car, in the hotel… I got familiar with my new talk. Joseph, who is my General Manager of the Greater China region, and Mario, my co-Founder, were with me and were of tremendous help, although I think Joseph was half-way between being terrified and having a heart attack when he had to correct my intonation as I practiced. Mandarin words have 5 inflections, so the right sound but wrong inflection means the difference, for example, between a horse and a mother. But I think things went OK. No one left during my presentation in either cities. The Q&As session at the end was lively and highly interactive, much more so than when I give a presentation to Chinese people in English, so all in all I think it was a success. And… I jumped over a big professional hurdle. Thank you, team, for your support. Thanks, Travel Link Daily, for the invitation. And to everyone who has ever had to present in a non-native language — I salute you for your courage. I just wrapped TripAdvisor’s Master Classes in Bangkok (at Banyan Tree) and Phuket (at the Moevenpick Spa and Resort Karon Beach). It was really great to see our customers in both places – I still remember the first client visit I made in 2009 to Thailand – it was at the Moevenpick and I met with the General Manager, Hans Frutiger, and the Director of Sales and Marketing, Craig Fong. At that time, social media was a seldom talked about topic in hospitality but Hans and Craig were kind enough to give Brand Karma a chance. They are tied for being the first customer for our analytic tool (the contract for Novotel Clarke Quay in Singapore came in on the same day around Christmas 2008 – the best present we’ve ever gotten!). Since then we’ve gotten more customers in Thailand – mostly through word-of-mouth in this small and tight-knit community. Therefore, coming back to Thailand, especially to Bangkok and Phuket, always warms my heart, because of the support we’ve had here, and the great customers we’ve gathered over the last few years. The Bangkok sessions were packed – I think there were in total over 400 people who attended both the morning and afternoon sessions. It was interactive, fast-paced, and fun. Even though I had heard Alvin give the TripAdvisor presentation 4 times in Indonesia, every time I had a new thought bubble and I’d Blackberry my team on the newfound insight. Siew Hoon – being the energetic and gracious moderator, kept the pace moving and the audience engaged. Particularly insightful in the Bangkok session was the panel discussion involving Arnaud Girodon (formerly GM of Indigo Pearl, now, GM of the soon-to-be-opened InterContinental in Koh Samui) and Eric Hallin (GM of Rembrandt Hotel in Bangkok). Both are very forward thinking in their approach on digital and direct booking – and with results to prove it. The Phuket sessions were also packed. Both Scot Tune (GM of Paresa) and Michael Nurtbalian (E-Commerce Manager at Indigo Pearl) shared war stories about their forays into social media. Scot had an incredible ROI case from his investment in TripAdvisor Business Listings, and Michael had an incredible ROI case from his investment in Facebook advertising from last Christmas. All in all – great learnings. If the presentations and the panel discussion fed my brain, something that happened in the last session in Phuket moved my heart. After Alvin finished his 8th (and final) presentation for this series, the questions that came in about some of TripAdvisor’s policies were passionate – much more so than in any other Master Class. There were a lot of concerns about the policy for fraudulent reviews. He went on to passionately explain that mistakes are costly because they impact a proprietor’s business in a direct and significant way. From the back of the room, I saw a lot of people nodding their heads in agreement. There I was, sitting in the ballroom of my first client, next to the GM who signed our first contract, and in a roomful of my customers. We began what we had to offer with a set of algorithms; at the time, that’s all we had… but it’s people who have carried us to where we are today. Thank you Hans, Craig, Simon (from Novotel Clarke Quay in Singapore) for signing a contract with an unknown entity when we first started. And thank you, Thailand, for reminding me for whom we started Brand Karma for: people, not machines. I had the pleasure of presenting at the inaugural Asia-Pacific TripAdvisor Master Classes in Jakarta and Bali with Alvin Ch’ng, Commercial Director APAC for TripAdvisor, and Siew-Hoon Yeoh, Producer of Web In Travel (WIT). We did 2 classes per day per location, and along with local hoteliers like Susanna Yong from Shangri-La Jakarta and Kevin Girard from the Conrad Bali, managed to share a lot about what we were seeing and what some hoteliers were doing to get ready for the digital marketing wave. 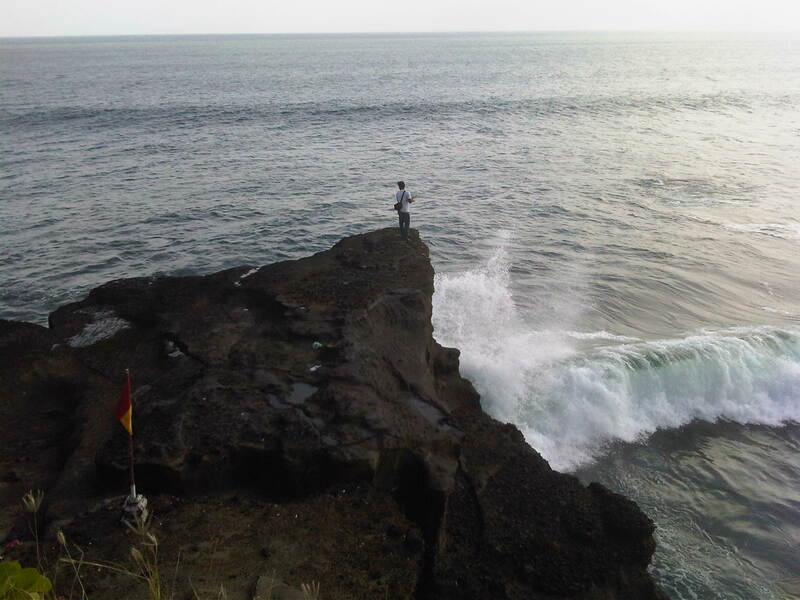 On the perch of one of the cliffs I watched waves come in from afar. When I visit my resort clients, I’m so used to going to their beaches to see the waves coming at eye level, the new perspective at Tanah Lot from a great height above was both refreshing and revealing. Waves begin their formation miles from shore. As they move closer, they either gain momentum and become larger to form white cap curls that surfers love to sneak under for a ride or they fizzle out and go flat. The rate at which the waves come in, whether they become a curl or not, is consistent, persistent, and fast. Who says nature moves at a slow speed? I used to be a lifeguard, but I can imagine how overwhelming (and scary) slow swimmers must feel when they get pounded by unrelenting waves. And it was with this realization that I understood how brand managers must be feeling with all this new digital stuff coming at them. New digital stuff pops up constantly; some end up becoming powerful waves (like Facebook), others fizzle out (like interactive TV). Some surprise you because they break the old patterns (like touch device — remember the tablet PC or Apple’s Newton? ), some are highly anticipated but end up failures (like MySpace, Google Buzz). What tool do you pick when things are constantly changing, and you can get swallowed up at anytime and end up with sand up your nostrils? The answer lies in who you are. Just like it really doesn’t matter what swim trunks you wear or what surf board you have if you know how to swim and surf, brand managers who know how to market will ride the wave of meaningful waves and skip the ones that fizzle out. Will they make mistakes? Absolutely. But on average, the good ones survive, just like good surfers get good waves most (but not all) of the time. And like people learning how to surf, as brand managers get better at marketing, they’ll be able to ride larger waves, experience thrills, and earn bragging rights that no one else can. An invisible hand has been guiding me, Mario, George, and the rest of the company in this direction already. This started after the Brand Karma party at WIT last year, which showed us that in addition to the Brand Karma tools, the company, as a group of people, had something else valuable to give. The question we’ve been wrestling with has been how to communicate that, make it actionable, as well as make it scalable. So we’ve been purposefully quiet since then, trying to organize ourselves to grow into this new shell after much soul searching. We had planned to launch our new initiative starting in August, and Bali, being the last speaking engagement for me in July, serendipitously gave me a vivid metaphor of the challenges our customers face, and reaffirmed my belief that we’re moving in the right direction. I’ve been to Sydney three times in my life, but this past week was my first experience in Australia with a sprinkling of Chilean volcanic ash. The cloud disrupted air travel resulting in the cancellation of ANZPHIC where I was scheduled to speak. However, the weather was absolutely gorgeous and Siew-Hoon kept the first-ever local market Web-in-Travel Conference on schedule with over 100 people, most of them Australian hoteliers, in attendance. It was just great seeing friends like Roland Jegge from WORLDHOTELS, Alvin Ch’ng from TripAdvisor, Craig Hewett from Wego, Grahame Tate from iDEAs, Bernadette Dennis from HSMAI, Paul Southey from TravelClick, and Timothy Hughes – who now is the new CEO of a new media company called Getaway Lounge, all attending. Despite these similarities, my experiences in Sydney and in Taipei, the most populous city in each country, could not have been more different. Sydney’s air was clean; a blue sky everyday with just the right winter nip – reminiscent of a nicely chilled sauvignon blanc. Taipei’s air? Cloggy and humid with temperatures increasing towards record breaking levels. Even with the opposing seasons, Sydney’s weather was remarkably more pleasant than Taipei’s. The last time Taiwanese weather was as nice as Sydney’s was during my childhood, and that was a long time ago when a lot of Taipei was still rice paddies. On the other hand, the service in Sydney was awful – ignored many times in some of the (not even busy) restaurants – my “thank yous” for the long-awaited water and menu were usually met with silence and averted eyes. I checked to see if I had a pimple on my forehead and the answer was no. In Taipei, the service staffs smile and politely ask if they can be of help – and you don’t even have to tip them! They will sometime even attempt to speak English. So despite the excellence of Sydney’s cuisine when I got served, specifically the seafood, I really missed having meals in Taipei – whether in a restaurant or at a street stall. There, at least people are willing to make eye contact and bring over the menu. Things weren’t like that everywhere: at the Sydney airport on my way out I was not ignored when I announced I was going to buy a 64G white iPad2 (an item perpetually out of stock in Taiwan). I walked out of the store with my new toy in 5 minutes, and almost $1000 USD short because the Australian currency is so high right now. Oh well. At least I can play Angry Birds now. I thought this was interesting. We have a few ex-pats in the Taiwan office, and I’ve heard that some of them sometimes are refused things like laundry service or a fork. In one instance, one of my guys had to buy twice the massage time because the masseuse gestured that he was “too big.” At least he thinks that’s what she conveyed. Anyway, this isn’t about who is more hospitable or more rude. You can choose to infer whatever you want from people’s behaviors. What I experienced was a reminder that travelers to any country will require some kindness – and for that – I don’t think Asian travelers are any different than travelers from anywhere else. I hope it won’t take another 40 years for things to advance; by then, like my father, I won’t want to take the long flight to Down Under. The need for positive social interactions is part of being human. So for the hosts, extend your kindness – karma will get you back for that “Can I help you?” accompanied with a smile. Is Social Media David or the Emperor (Part III)? To understand how a brand strengthens a customer relationship — a phase called “Build Up,” we can first examine how it works with humans. Let’s say you have a collection of ideas that forms a first impression about a person. These come from a jumble of sources and can be about anything. But, now you’re interested in moving beyond the acquaintance stage. You’ve decided to invest time in developing a relationship. This signifies the beginning of the Build Up stage, where you’re ready to build a bridge and strengthen the connection. In a romantic relationship, this can be wooing or courting. You begin thinking and talking to this person more each day. Then, piece by piece, guards come down, and more information is shared. Text messages turn into late night conversations. Time passes easily. Not only do you get to know who someone actually is, but you also get to know who that person is to you. If there is personal compatibility, then great. Sharing the same sense of humor, views, or activities will bring people together. Chemistry is one prerequisite for growing a relationship. But it is how that person treats you, and how you treat them, that determine relationship success. Communication is the cornerstone of relationship success. Creating an atmosphere of trust, honesty, and openness all start with healthy communication. Having fun together is another ingredient. Fun provides a source of joy for each party and it’s not just for kids. Rituals provide a sense of continuity and stability. They are points of reinforcement. Compromise is another factor. People need to give up certain demands or desires to satisfy the needs of the other. Reaching this point allows both parties to mutually enjoy the interaction and feel valued within the relationship. Reciprocity, which is critical in developing human relations, manifests itself in all the above actions that people take to get closer. It’s no different for brands and their customers. And unlike traditional media, social media provides an scalable channel to engage with consumers in such a way that invites continuous reciprocity — which can lead to greater customer intimacy. However, knowingly deceiving, lying, and cheating on someone is a sure way to get to the Deterioration and Termination stages. You’re definitely not growing a relationship by lying to your spouse or stealing money from a friend, so why would it be any different in the business world? Enron. WorldCom. Madoff. Tiger Woods. In thinking about the development of interpersonal relationships, I looked into my own past and the failure of my most significant romantic relationship. Infatuation and chemistry were bolstered with intimacy, trust, honesty and loyalty; it had all the hallmarks of a success. How did I go from success to failure? How does anyone? It begins with what you don’t do. Although most of us communicate, we don’t communicate problems within the relationship. This fear of discomfort becomes malignant overtime. Then, one day, you end up in screaming match, full-blown, red faced with a veiny forehead over whether the mailman comes at 4:30 or 5:30. Let’s face it: you’re not really fighting about the mail, are you? Emotional disconnection and lack of awareness of each other’s needs created poison. Eventually, you hear “hate” somewhere, and the relationship spirals downward uncontrollably. Making someone know that they are loved is just as important as loving that person. Communication, acknowledgement, and appreciation are just as essential in brand-customer relationships. In hospitality, customers are lost for six main reasons; 1) death, 2) they move, 3) they make a friend in a new business, 4) they defect to a competitor, 5) they are dissatisfied with the product, 6) they experienced an attitude of indifference from one or more employees. Guess which is the primary reason? #6, allotting for 68% of total customer departure. The lesson here is to cultivate intimacy with the people you want to be closer. They need to trust that you are acting with their best interests in mind, even if it’s brewing a cup of coffee. You can use social media to engage effectively by using it as at least as a communication channel. The more you converse and do together, the closer you will be with your customers. Partners in a healthy relationship improve each other as people. Someone really smart once shared an insightful tip. She said that we each have seven staples holding together your life. These people help secure your place in the world defining parts and portions of where you’ve been, where you’ve come from, and where you are going. They provide your sense of identity. Maybe a staple is a neighborhood friend, a family member, a particular coach or teacher, a high school or college classmate, or a coworker. These people and the memories you share with them constitute your life. We derive strength from these relationships, celebrating the good times and finding comfort and security during the difficult. A company should strive for this type of relationship with their customers — to become a staple. During the 2008 financial crisis, Howard Schultz visited a Starbucks in downtown LA to inquire as to how, with the state of the economy, did they get people to keep coming back. The store manager went to the source and pulled a regular customer into her office. The man entered with a gun on his hip. He was a detective for the Los Angeles Police Department. Schultz recounts the conversation as follows, “I could just as easily go to a 7-Eleven,” the officer said matter-of-factly. Then he shared a conversation that he and his wife had had at their kitchen table that past weekend as they reviewed their family’s budget, just as millions of other families had been doing of late. And this is what a successful, fully developed brand-customer relationship looks like. To the LAPD Detective, Starbucks was a positive part of his identity. He could depend on the company to deliver an emotional experience that recharged him and alleviated the stresses of his day-to-day life. Even in times of financial strain, this was one thing he wouldn’t sacrifice. Whereas the LAPD Detective told Schulz this when asked, your loyal customers, evangelists, are telling everyone else in their circle how they feel about your brand everyday in social media and via their actions. Why? Because the brand has become a staple in their lives — the brand is a part of their self-identity. Fostering this type of relationship provides monetary benefit. The police officer’s story demonstrates the secured revenue from developing strong brand-customer relationships. While he purchases a cup of coffee, he is buying the whole experience. The relationship grew with each successive visit. His interaction with the baristas added value through emotional engagement. He trusted in Starbucks and in his store. And each day, he returned to enjoy these connections. When people make purchase decisions, they face a tradeoff between products. During times of financial struggle, they must make sacrifices. Through developing strong connections overtime, a loyal customer will sacrifice other products and allocate more resources to your brand. What did this mean for Starbuck’s bottom line? He’s not at 7-Eleven. He’s drinking that four-dollar latte. So is social media overhyped or undervalued? No one can make provide a definitive yes or no answer without attaching a few exceptions. Overvalued? Certainly… in some situations. Spamming customers with tweets will detract from the relationship. However, something like a weekly blog can become a ritual. The online forums offer digital spaces for relationships to develop. They provide spaces to have fun, such as generating brand relevant games for you customer. The conversation has simply moved to another space, but the same strategies still apply. Create trust and mutual respect. Provide open and honest feedback that helps both parties move forward in the relationship. When a brand falters, they have the opportunity to reach their customer base and tackle issues head on. But does it yield ROI? Entertain this thought. You are an owner of a hotel and you have a current guest. The guest loves your hotel, adores it. He is sitting beside your pool and ordering sangria after sangria. As the owner, you are happy with this customer, especially from a financial standpoint. Not only has him paid three nights for a suite, but also, he is currently spending on property. What if he can take a picture and post ”PERFECT SANGRIA!” He’s generating marketing value on a number of levels, consumer review, product buzz, and valuable feedback for strategic decisions. And what if this actually appears on a site that you own? You can eliminate the ‘clicking out’ to check out another intermediary that has reviews by having credible, real-time customer feedback on your own site. The more traffic you retain, the more business you capture directly… and the less commission you have to pay. This is one example of how social media can improve your ROI. And relates back to the message in Part I of this series — the business you don’t lose is at least as important as the new business you gain. However, the greater value is the dialogue with customers. The heart of social media is conversation. Therefore, customers feel more involved. In turn, companies can demonstrate a greater level of concern through adopting recommendations. This satisfies customer demand and makes them feel valued and appreciated instead of apathetic. Also, customers have access to upper level decision makers beyond in store personal. Therefore, emotional engagement transcends in store experience and involves the organization as a whole. Fostering emotional involvement with greater depth generated financial return for Starbucks. Likewise, using social media to strengthen attachment and develop relationships can assist a brand in becoming a staple in a customer’s life. Traditional media can not do that because it has no reciprocity dimension. This is why social media is so powerful — it extends your guest experience and allows you to engage in a meaningful 2-way relationship. Rather than splattering ads everywhere to hopefully catch the right people’s attention, you can go about creating value for your target customers, and be loved and recommended for it. Social media is David. It’s a new way to win customers by engaging with them in a personalized manner that connects the soul of your brand with their hearts and minds. And you can bet that if the Emperor weren’t wearing cloths, with social media, at least he would find out. Is Social Media David or the Emperor (Part II)? The following is a continuation of a post that discussed whether social media is the Emperor without clothes or David in David v. Goliath. This post focuses on brand engagement in social channels. And while they teach us in school not to answer a question with a question, I inevitably always do. “What are you trying to accomplish?” is my usual reply. Before you engage in social anything, you should have a good answer to this question. Are you trying to increase brand awareness? Extend your brand experience online? Attract influencers? Create an alternative communication channel? Obtain lifestyle information to incorporate into your CRM? Make a few sales? None of the above, some of the above, or… all of the above? What, exactly, does success look like? This is step 1 and the one question that you must answer. There is no simple answer to the question, “How can I use social networks for my brand?” because a good answer involves your overall brand strategy. Without proper planning, throwing up a fan page or a micro-blog, in any language, is a one-way road to zero in terms of impact. Facebook, Kaixin001, RenRen, Twitter, Weibo, YouTube, YouKu, etc. — all of the popular social services that have millions of users — are littered with failed attempts by brands trying to authentically join consumer conversations without a clear plan as to how. Social networks, and the user-generated content each network’s members produce, are not cubs but lions of brand communications. This is a serious medium, and one that should not be handed over to a junior intern unless you want to deal with the consequences (see Marc Jacobs’ recent situation for what could happen). Digital social engagement is new human behavior, and not everyone likes it. Also, we’re adapting to the variables of this medium at the same time the medium is being formed and changing. In a way, Facebook is really like the Big Bang — and its resulting universe is still volatile and changing. However, like the laws of physics that govern our offline universe, it is the rules of human relationships that provide valuable insights on how brands can engage within the online (or social) universe. Acquaintance – Becoming acquainted depends on previous relationships, physical proximity, first impressions, and a variety of other factors. If two people begin to like each other, continued interactions may lead to the next stage, but acquaintance can continue indefinitely. Continuation – This stage follows a mutual commitment to a long-term friendship, romantic relationship, or marriage. It is generally a long, relative stable period. Nevertheless, continued growth and development will occur during this time. Mutual trust is important for sustaining the relationship. Termination – The final stage marks the end of the relationship, either by death in the case of a healthy relationship, or by separation. While the stages in this model were first developed to describe adult, romantic relationships, then later applied to other relationships, sociologists have found applicability of this model to consumer-brand relationships. Social networks have accelerated the understanding of this model because the evidences of these relationships can more or less be easily seen… and over many many relationships, which, by the way, is another reason why understanding social media about your brand is critical. Not doing so is tantamount to not ever listening to the compliments or complaints of your friend/spouse/co-worker/parent/child/teacher/etc. Back to engagement: understanding stages 1-3 is critical for every brand manager in order to avoid stages 4-5. Note that “selling as a hidden agenda” is a quick way to get to stage 4 — either because the other party feels bored by the constant hawking or betrayed from an abuse of trust. So what are the social network manifestations of stages 1-3? In the Acquaintance stage — it’s important to establish a positive first impression. So — you should think, where will people get their first impression, and how positive will that impression be? Here, you’ve got a paradigm shift. Whereas in most of the 20th century the ‘where’ and ‘how positive’ first impressions could be largely controlled by a (very good) advertising agency and a (very good) PR agency — that’s no longer the case. Nowadays, in addition to the controllable sources, the first impression people have of your brand can, and most likely will, come from 1) snippets in organic Google search results (from sites that have user reviews like TripAdvisor) or 2) fan likes/posts/comments on walls. If you want the maximum prospects, pay attention to the non-traditional sources and make sure you’re making a good impression. A slight aside — it is completely possible that you have the best brand but no one knows about it. So one way in which you could gain more acquaintance is through advertising. In this way — any type of online advertising will do. Banner, PPC, SEM, social advertising, etc. Each of them have their own strengths and weaknesses. For social advertising — if the goal is to gain more acquaintances — then you should make sure you clearly identify whom you want to be acquainted with. Ideally, the whom should look pretty close to the profile of your ideal customers — i.e. the ones that are going to be most satisfied with your service AND also allow you to declare success if you get the chance to have a relationship with them. This means that it’s just as important for you to define whom you won’t target (i.e. the type of friends that would raise eyebrows if you brought them home to meet your family). In the Build Up stage — the trust and caring begins for both parties in the relationship. For brand managers, it’s the make or break stage. Is Social Media David or the Emperor?